Chains.cc helps you track--and brag about--your progress on developing good habits. Some habits are things you want to do every day, or nearly every day: Exercise, for example, or writing. Jerry Seinfeld is said to have used "productivity chains" in which he would do something each and every day, and never "break the chain," and in this way make steady progress. Chains.cc is a slick and simple free service built on this concept. Chains.cc lets you track any number of habits. For every day when you've done what the habit calls for, simply log into Chains.cc and mark the day as done. Whenever your chain grows by another week, Chains.cc will offer you an easy way to brag about it on Facebook if you want to do so. 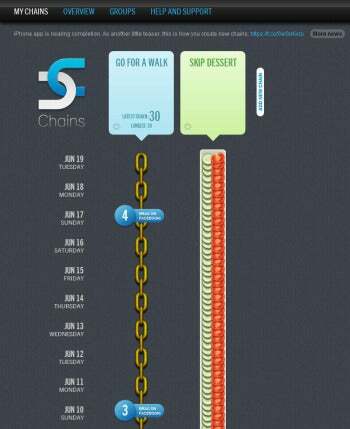 The top of each chain shows your longest streak, as well as the length of your latest streak.